Washington Central students learn to give back to their community. U-32’s Seeking Social Justice Club was formed at the beginning of this school year. The club is led by two teachers, Meg Allison and Amy Koenigbauer, with student members from grades 7-12. 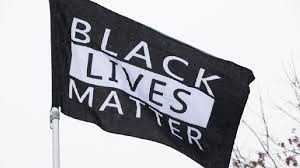 “Our goal is to raise awareness throughout the school community about issues that are important and matter to us,” said Sylvan Williams, a member of the Social Justice Club. Some of the issues the club has brought up are racism and sexism within our school. Some examples include how to respond to someone using the word “gay” in a derogatory way and how to deal with swastikas drawn on the school walls. Our club has talked to school administration and had important conversations on how to move forward. U-32 students recognized the 17 victims from Marjory Stoneman Douglas High School on March 21. Unlike several schools across the country that held their school walkout March 14, U-32 and Montpelier High School postponed their walkout until Wednesday, March 21st because of a snowstorm. With the support of Principal, Steven Dellinger-Pate, as well as Superintendent Bill Kimball, we were able to focus on creating an inclusive school climate. However, because of safety reasons, the walkout was closed to public participation. At 10 am on the 21st of March students silently left their classes and walked outside to the front of the school. Noah Witke-Mile (senior), Bruno John (sophomore), Sylvan Williams (sophomore), and myself, Ginger Knight (sophomore) spoke in front of an audience of almost 300 students and faculty. Noah opened with a moment of silence to recognize the 17 victims from Marjory Stoneman Douglas High School. Students and teachers held posters in solidarity. Sylvan read a moving poem called, “Mama, Enough.” Bruno made a speech about the sickness of the NRA, while I read the names of each and every victim shot at MSD. The Times Argus was present and interviewed the speakers after the 17 minutes were over. There were several teachers who walked out. Nick Holquist, a Middle School English teacher said, “I participated because I was inspired by students organizing it on their own. It is amazing how students got together and made it happen.” For the rest of the day, students attended classes and some talked with their peers about the walkout. Many students talked about the signs that were held including one that said, “I ♡ the NRA”. “I feel as though the student that held up the “I ♡ the NRA” was standing up for what they believe in. This walkout was meant to be for the 17 students that passed away, and it turned into a walkout for people who were not supporters of guns,” said an anonymous student who didn’t join the walkout. The following week, our Principal, Steven Dellinger-Pate, held a forum for students who didn’t have a chance to speak in the walkout to have their voices heard. About 10-12 students showed up to have a respectful conversation with the principal. 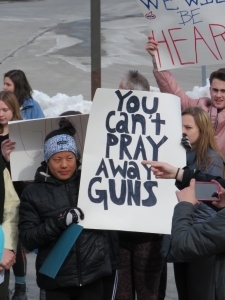 The majority of those who attended believed the walkout had a good outcome, but they expressed a need for more dialogue with their peers around current and controversial issues. Our principal stated he would be offering more opportunities for students to engage in civil dialogue respectfully. To our surprise, Noah Witke-Mile was interviewed by a Toronto based news channel about our school walkout. This goes to show how far reaching this student-based movement is. No matter what side of the gun issue you’re on, we all agree we do not want to be the next victims of a school shooting. As a school community, I believe it is very important to engage with others and listen to what other people have to say. The Seeking Social Justice Club will continue to speak up and create positive change. 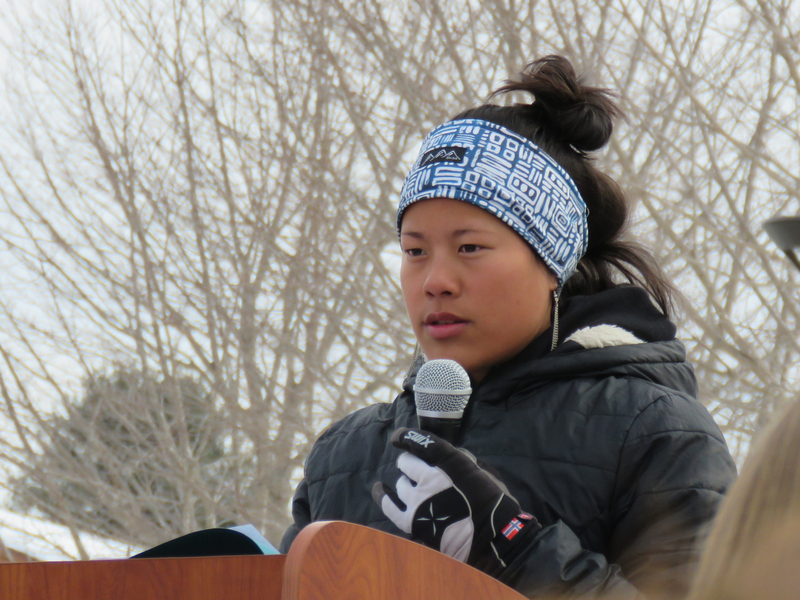 Editor’s note: For more on the walkout, see the U-32 Chronicle article. Do you need help planting your garden? Painting your house? Moving firewood? Taking down storm windows? The U-32 High School Student Council is planning a day of community outreach: a chance for seniors at U-32 to give back to the community that has helped support them so much over the years. The Senior Community Outreach Project (SCOP) will take place on Monday, June 11th between 10:00 AM and 2:00 PM. We are seeking projects for small or large crews in the Middlesex, Worcester, East Montpelier, Berlin, and Calais communities. Let us know if you are in need of assistance, no job is too big or too small! Preference will be given to senior citizens and people with disabilities. To suggest a project or for more information, please email us at u32scop@gmail.com and ask to fill out a SCOP Project Request Form. We will no longer be accepting jobs past May 1st! If you are unable to complete the online form, please leave a message with your information (email, phone, name, project, location) at our SCOP extension at U-32, (802) 229-0321 ext. 5991. Berlin Elementary sent two teams to the recent Jr. Iron Chef competition. They worked very hard to learn complicated recipes and represented Berlin with confidence. Congratulations “Can’t Beet the Bobcats” and Berlin Bakers! So far, this semester, U-32 Inc, a student-run entrepreneurial experience, has teamed up to create two products. Initially, George Cook’s class began the semester in collaboration with Dave Bazis and the Furniture Design class at U-32. Through a collaborative effort, Bazis’s students instructed Cook’s students in the production phase. Cook said, “I cannot tell you how instrumental they were in the process. Their craftsmanship is fantastic!” In total, the students created 53 cutting boards, each individually unique. No two boards were the same. The prices ranged from $20 to $48. To their surprise, all 53 boards were sold, in less than 80 minutes! Currently, a “giving” arm of Inc. is being developed and they have introduced #U32daysofgiving. In this endeavor, Cook’s class has teamed up with Nutty Steph’s chocolate shop from Middlesex (VT). 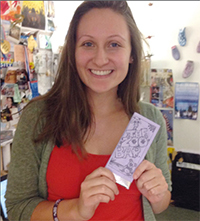 Junior Wyatt Mashkuri designed the labels and, working with Nutty Stephs, they purchased 75 bars from her. The group invited all U-32 students to submit recommendations for other individuals in the building to nominate folks who have performed random acts of kindness within the U-32 learning community! Now, the class is awarding the chocolate bars to 32, U-32 students, for being kind! You can check out their instagram feed. One student at at time, one year at a time, U-32 has been cultivating youth ambassadors in countries with significant Muslim populations. This is made possible by the Kennedy-Lugar YES Abroad Program, an exchange program sponsored by the US Department of State. YES was started in the aftermath of September 11, 2001, as an effort to increase dialogue and mutual understanding between people of the US and people of countries with significant Muslim populations. Initially, it was a way for students from abroad to live and study in the US, but in 2007, it was expanded to include US students. Each year, 65 American students win this scholarship to study abroad in a country that has a significant Muslim population, and U-32 students have a great record of being selected for this fully funded school year exchange program. Students can spend their junior, senior or gap years immersed in another culture. In 2013-14, Quinn McVeigh (class of 2015) travelled to Oman, making lasting connections with her host family. In 2014-15, Katie Ware spent her junior year in the Philippines and Rachael Phillips (class of 2015) spent her senior year in Sarajevo, Bosnia. Last year, Kanwara “Pui” Limakara from Thailand, came to U-32 on a YES exchange (the program that brings students from countries with significant Muslim populations here to the US). Cricket is blogging about her experience this year through vttodakar.wordpress.com and is happy to answer any questions about what it is like to apply, and to be on exchange through this program. Think you might be the next U-32 ambassador or know of a young person who could be? Check out the YES Abroad website for application information. The deadline for applying for the 2017-18 year was December 1st, 2016, but it’s not too early to be dreaming and planning for 2018-19. 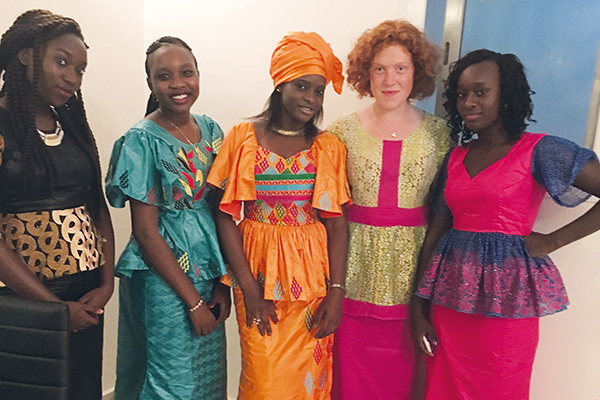 This year’s students are abroad in Bosnia and Herzegovina, Bulgaria, Ghana, India, Indonesia, Jordan, Macedonia, Malaysia, Morocco, the Philippines, Senegal, and Thailand. Berlin Elementary School has reusables, so we don’t throw away paper plates and plastic utensils anymore. Before November 2016, we threw away paper and plastic, when we had classroom parties and school celebrations. Teachers and parents wasted money by buying paper and plastic products. B.E.S. wasted money by paying for our garbage to be taken away to the landfill. Instead, we could have used reusables and washed our dishes. But Berlin Elementary did not have the money to buy reusables. So Ms. Dawkins wrote a School Zero Waste grant from Central Vermont Solid Waste Management District (CVSWMD). 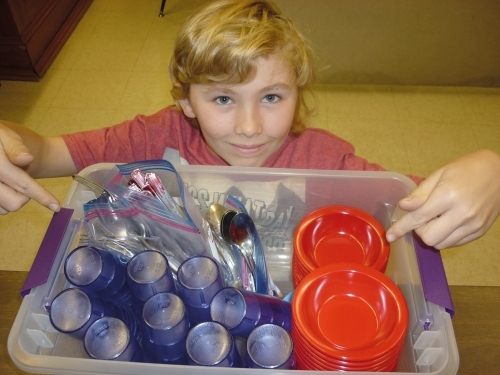 The School Zero Waste grant is for reducing waste, so they liked the idea of reusables. Now, each classroom has the following reusables: metal utensils, plastic bowls, plastic cups. The utensils are stored in a plastic-covered box. Now when we have parties, school celebrations, and daily healthy snack, we can use reusables, instead of paper plates, paper cups, and plastic spoons or forks. Thanks to CVSWMD, Berlin Elementary School is a GREENER place. The U-32 Student Council has always seen service as part of its mission. Many community members may have heard of their program, SCOP, Senior Community Outreach Project, which matches seniors in their last week of school with community members in need of help. 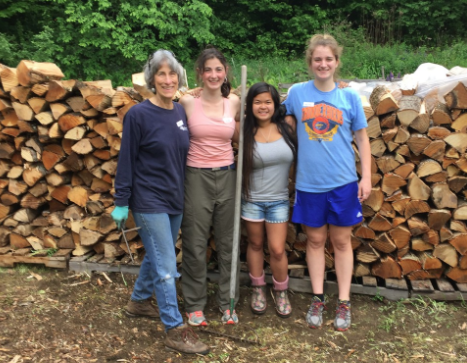 For one day, whether it be wood stacking, gardening, or painting to name a few, students branch out across our community to perform service. Their blood drives are also well-known and well-served. Less well-known perhaps are their days of food sorting at the Vermont Food Bank or shelving books at local libraries. They recently participated in running a Wellness Day at U-32, promoting wellness through nutrition, tobacco prevention, with partner Central Vermont New Directions, rock climbing, and blood pressure testing performed by Allison Gauthier’s Anatomy class. 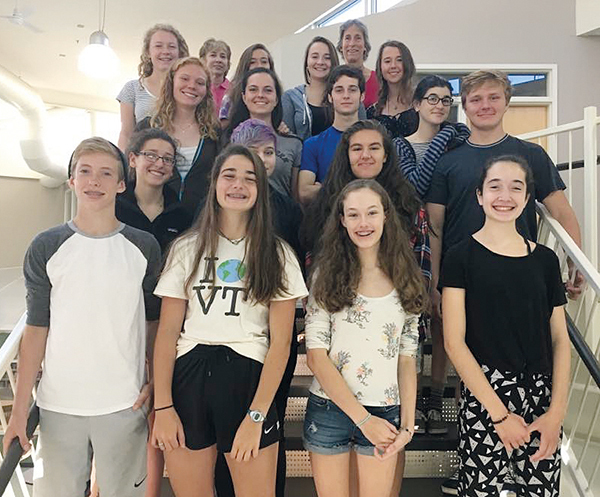 The Student Council wants to do even more by offering monthly service opportunities for middle and high school students to help community members in our 5 town district. November’s goal is food drives. If you would benefit from service from a group of students please email either Emma Curchin, co-President, at ecurchin17@wcsu32.org or Kit Walker, co-Teacher Adviser, @ kwalker@wcsu32.org. Or contact any one of their members, one of their four Presidents, Ellie Stroh, Lauren Morse, Emily Richards, or Emma Curchin, or either of their teacher advisors, Kit Walker or Deb Stevens.